Denver has alternated wins and losses over its last eight games, as it comes off a 99-94 victory over the Memphis Grizzlies as one-point home favorites. “Against a really good team, that was a really good win for us,” stated Nuggets forward Danilo Gallinari. He is one of four probable starters that are averaging in double figures this year. The Nuggets are 6-11 on the road this season, including a 4-6 mark versus Western Conference opponents. Denver is 1-2 ATS as a road favorite of 3.5 to 6 points this season, which can’t be ignored when making your NBA picks against the spread on Sunday. The Nuggets have won 14 of their last 21 games against the Kings, but have gone 4-4 at the Sleep Train Arena over the past four-plus campaigns. Denver won all three overall meetings a year ago, including a 122-93 blowout win as six-point road favorites on Jan. 25. The team finished with a season-high 27 fast break points last time out, which pushed their average to 19.3 on the season in that particular category. Sacramento returns home after dropping three of four on the road, including a 113-103 setback to the Oklahoma City Thunder as 13-point underdogs. “I thought our guys played and competed,” stated Kings head coach Keith Smart. The Kings have a chance to break out offensively against the Nuggets, who are allowing opponents to score 103.5 points when they are on the road. The franchise ranks fourth in the NBA in averaging 44.6 points per game in the paint. Sacramento is 4-7 ATS at home this season. The Kings are hoping that guard Tyreke Evans can continue his strong play on the offensive end, averaging 21.6 points in 33.0 minutes of action in his last five games. Sacramento has lost the last five meetings in this series, as it also looks to snap a two-game home losing streak versus Denver. Sports bettors will likely play the total in this affair, as the OVER is 3-0-1 in the Kings four games this season when facing a team that averages 99 or more points per game. 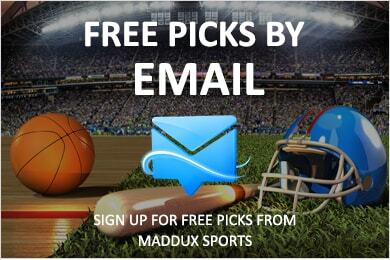 Don’t miss out on a winning season and let the NBA handicappers at Maddux Sports line your pockets with cash. Long term packages are available now!